This isn't marked as a web exclusive, so British Cycling members should be able to get it for £90. The RRP is marked as £154.49, but that's the price at Chain Reaction. The actual RRP is £209.99. The next cheapest seems to be Wiggle at £129.99. 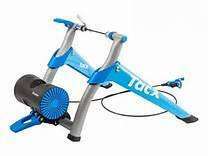 The Tacx Booster Ultra High Power Folding Magnetic Trainer provides you with the ultimate virtual training experience allowing realistic rolling, air and incline resistances. The Booster is particularly quick and easy to assemble, with its integrated braking system the rider is safe from contact with the hot freewheel during high impact training. Voted turbo-hot because every turbo-knob head MAMIL should own one of … Voted turbo-hot because every turbo-knob head MAMIL should own one of these so they stay off the roads. When you add up how many minutes (or hours) a day we spend sat stationary in our cars, vans etc (in traffic queues, waiting at lights, roundabouts, junctions, accidents and roadworks) and it seems that waiting a few seconds to (safely) pass a cyclist because they're 'in the way' is unacceptable. Who's the knob head! I have this exact turbo trainer and it does everything I need. The only issue I have with it is that the resistance adjuster thingie is a bit plasticky and difficult to shift easily. When you add up how many minutes (or hours) a day we spend sat … When you add up how many minutes (or hours) a day we spend sat stationary in our cars, vans etc (in traffic queues, waiting at lights, roundabouts, junctions, accidents and roadworks) and it seems that waiting a few seconds to (safely) pass a cyclist because they're 'in the way' is unacceptable. Who's the knob head! Well said. Charliemike sounded like a bit of a **** to be fair. As per description above - Universal fit for wheels with diameter 600 to 710 mm. So yes, it will. You just need to use with a slick tyre. As per description above - Universal fit for wheels with diameter 600 to …As per description above - Universal fit for wheels with diameter 600 to 710 mm. So yes, it will.You just need to use with a slick tyre. Yer saw the description but I meant width not wheel diameter.